My Friends Tigger & Pooh - This Mystery is History! From Walt Disney Studios, comes My Friends Tigger & Pooh - This Mystery is History! 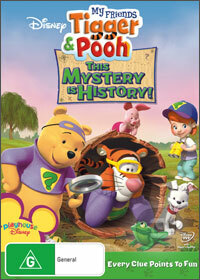 which features the classic characters of this entertaining series which includes Pooh, Tigger, Darby and Buster. Although this is a children's entertainment program, it features some edutainment along the way and some great music to help with the overall kid friendly enjoyment of the title. Featuring a variety of kid friendly tales, the first tale involves Tigger and when a stripe on his tail disappears, it's up to the gang to discover what has happened. The fun aspect of My Friends Tigger & Pooh - This Mystery is History!, is that is allows the viewer to get involved. Following Tigger's missing stripe, it's time to find the magical Woozle Wizard and although it involves a wizard granting wishes, it's more about learning to whistle which is a very entertaining episode that our four-year old son enjoyed thoroughly. To compliment the story is the colourful animation that has these classic characters come to life and although may not be on par with the Disney movies of late, it's still very cool for a made for TV show. At the end of the day, My Friends Tigger & Pooh - This Mystery is History! features entertainment, education, mystery and friendship, all perfect perfect for the younger viewer. Add in a bonus episode entitled Little Einstein's: The Great Schubert's Guessing Game and it's the perfect way to finish this discette.